There's an odd sign hanging on an old church. Getting to the bottom of it took us to a conspiratorial place. At the corner of Fairmount and Mahon streets, in Uptown, there’s an old church for sale. Built in 1910, it was designed by the same architect responsible for the downtown Neiman Marcus. Asking price: $8.4 million. But what caught my attention while walking past it recently was a sign bolted to a brick wall near a side entrance. 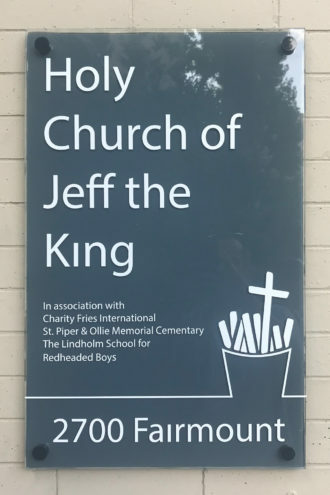 It read: “Holy Church of Jeff the King/In association with Charity Fries International/St. Piper & Ollie Memorial Cementary/The Lindholm School for Redheaded Boys.” And then there was the logo: a cross sticking out of a box of fast-food French fries. I’m accustomed to digging for information, but getting to the bottom of this was a weeks-long endeavor that took me to a conspiratorial place. It didn’t help that officials listed on tax documents didn’t return calls. Or that a guy I’d never heard of left me a voicemail indicating he knew the story behind the sign—but then fell off the grid. Or that the sign was removed shortly after I’d started asking questions about it. I had pretty much concluded that Dallas, ever criticized for erasing its own history, had wiped out all proof of a monarchy and subsequent religion—until Tommy Heitkamp, the guy who’d left the voicemail, re-emerged. Inside Joke: The sign raised so many questions. Who is King Jeff? Why does his church’s logo involve a cross sticking out of a box of fries? Heitkamp works for Theropoda Expeditions, a commercial paleontological firm whose founder owns the church. Heitkamp made the sign. And it’s all a pack of lies. Well, sort of. Heitkamp moved to Los Angeles with two buddies—Jeff King and David Lindholm—after college. Their separate career tracks (King is a screenwriter, Lindholm an athletics director) consistently left at least one of the roommates with a good paycheck and at least one earning next to nothing. Whenever the guy making the most went out for dinner, he’d buy an extra order of fries for the one making the least. They called them charity fries. Over the years, that turned into charity drinks and charity tickets to concerts. Eventually, whoever was barely scraping by was given the rotating nickname Charity Fries. They could only afford to rent a small house, where Heitkamp initially lived in a closet. When King eventually married and bought a house, he put up a small plaque declaring a nook under the stairs the Heitkamp Honeymoon Suite. When Lindholm bought a house, he did something similar with a nook in a bedroom. So when King came to visit Dallas earlier this year, Heitkamp went bigger and created the Holy Church of Jeff the King marker. The St. Piper and Ollie Memorial Cementary [sic] is a nod to King’s dogs, whom Heitkamp hates. He and Lindholm are both redheads who tower over the dark-haired King, hence the Lindholm School for Redheaded Boys. The sign was only going to be up for a weekend, but Heitkamp was so happy with how it looked that he left it up. Until brokers showing the church to prospective buyers and renters got tired of all the questions and took it down. “It was just another escalation of a joke that hasn’t died, basically,” Heitkamp says. King and Lindholm, it’s your move.